Black college enrollment reached its highest level on record in October 2010. 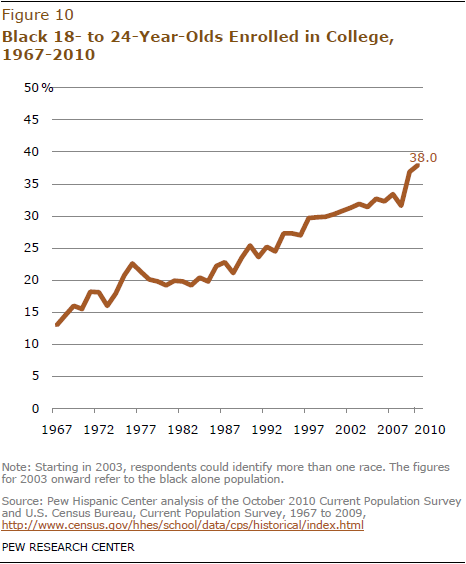 Akin to young Hispanics, record young black college enrollment reflects educational strides as well as population gains. In October 2010, 38% of black 18- to 24-year-olds were enrolled in college. This eclipsed the prior high of 37% recorded in October 2009. An important factor underlying the black college enrollment increase is that more young blacks are completing high school and thus are eligible to pursue college. 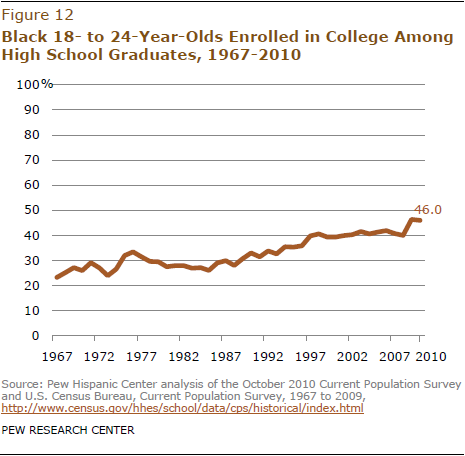 In October 2010, 83% of black 18- to 24-year-olds had completed high school. This represents a historical high in young black high school completion. In October 2010, 46.0% of young black high school completers were enrolled in college. This rate is significantly above the levels prevailing before 2009 when enrollment rates ranged from 40% to 42%, but is lower than the record 46.4% in October 2009.